At a recent Management Board meeting, it was decided that the 2019 WCU AGM will be held on Sunday 7th April 2019. The venue has yet to be decided. The Adult Community Learning Services of Cardiff Council are running a Chess Course for Beginners starting on Tuesday 18 September and running for 11 weeks (not including Half-Term). 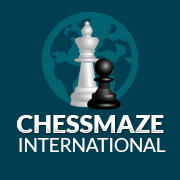 The International Corresopondence Chess Federation (ICCF) are seeking players wishing to take part in the Colwyn Bay and Friends v ICCF match on Monday 20th August at 20.00 as part of the ICCF Congress activities. Tim Kett finished =2nd at the recent Eastman Open in Gent, Belgium finishing on 7/9. His report can be viewed here. The games can be downloaded from the Ganes page. A new chess club has opened in Penlan, Swansea.